Add Mattress Pad? Yes, please! (Add $5.00) No, thanks! 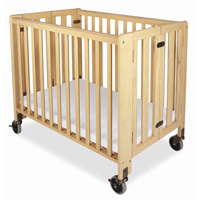 Our inventory of cribs is especially designed for the rental industry. With easy set-up (NO ASSEMBLY REQUIRED! ), these cribs are the best way to ensure a good night's sleep for your little one! Our cribs meet or exceed new JPMA and CPSC safety standards.